Roush Fenway Racing will bench rookie Colin Braun for two races in the aftermath of a crash with teammate Ricky Stenhouse, Jr., in Monday's NASCAR Nationwide Series race at Texas Motor Speedway. Speaking on the condition of anonymity, a high-level source within the team told Sirius NASCAR Radio's Sirius Speedway with Dave Moody that RFR initially considered removing Braun from the ride permanently, but relented after sponsor ConWay Freight advocated a more lenient sanction. Braun will be in the ConWay-backed car this weekend at Talledega Superspeedway, before being replaced by former Sprint Cup Series champion Matt Kenseth in an unsponsored #16 Ford at both Richmond and Darlington. Braun has struggled in his rookie season of Nationwide Series competition, with a quartet of crash-related DNFs at Daytona, Las Vegas, Bristol and Phoenix. He has posted an average finish of 29.3 in his seven starts this season, with a best finish of 13th at Texas last week. 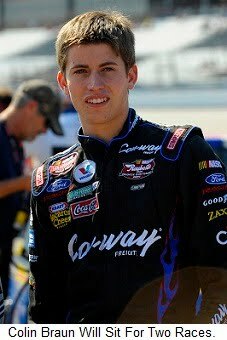 He currently ranks 25th in Nationwide Series championship points. 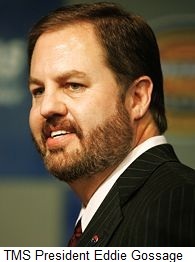 Texas Motor Speedway President Eddie Gossage accused start-and-park teams in the NASCAR Nationwide and Sprint Cup Series of "stealing money" last week, and said NASCAR needs to take action to eliminate them from the sport. "(They) are simply stealing," said Gossage Saturday. "I don't blame them for finding the loophole, but they are going to steal a half a million dollars of our money here tomorrow. They add nothing to the show, not one darn thing. They're stealing. I want real racers, but they're not racing." Gossage called on NASCAR to either reduce the number of cars in each Sprint Cup race from 43 to 36 -– eliminating more than $500,000 from the purse -– or change the distribution of prize money to make back-of-the-pack finishes less rewarding. “Last place here is going to pay about $85,000," he said. "That should be $10,000 and the rest of the money should go to the top finishers. NASCAR has an obligation to the fans to not allow this. People are stealing in broad daylight in front of 150,000 fans in the grandstands and millions of people watching at home." While interesting at face value, Gossage’s quick fixes actually accomplish nothing. A smaller, 36-car starting field would require NASCAR to reduce the number of guaranteed starters in each race. The remaining positions would remain up for grabs among the so-called “Go Or Go Home” teams, many of whom would continue to qualify on Friday, only to start and park on Sunday. Cutting the field does not eliminate "start and park." It only cuts the field. Slashing the payout for the final few positions would save Gossage a cool half-million dollars, but it will do nothing to eliminate "start and park." Low-dollar teams aren't dropping out early because they want to, they're doing it because they have to. They cannot afford the tire and engine bills associated with running the full distance every week, and also cannot risk destroying a racecar. 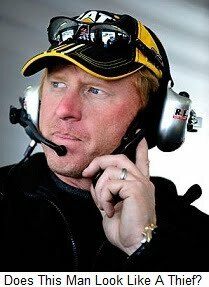 Neither NASCAR nor Eddie Gossage can force a man to spend money that he does not have, and Gossage's back-of-the-pack purse cut will accomplish nothing but forcing struggling teams like Prism Motorsports, NEMCO and Tommy Baldwin Racing out of business. Hendrick Motorsports sent a clear message that it intends to set the pace in NASCAR Sprint Cup Series racing for years to come last week, announcing that Kasey Kahne will leave Richard Petty Motorsports at the conclusion of this season to drive for HMS, beginning in 2012. Widespread speculation has Stewart Haas Racing the leading candidate to host Kahne next season, fielding a much-anticipated third Chevrolet with considerable support and logistical help from Hendrick. Tony Stewart admitted that he and Hendrick spoke about the possibility early last week, but insisted that it was far too early even to speculate about a Kahne-Stewart- Ryan Newman triumvirate for 2012. While Kahne’s signing cemented Hendrick Motorsports’ status as NASCAR’s top team for at least the foreseeable future, it delivered a body blow to Kahne’s current employer, Richard Petty Motorsports. Just days before, reports surfaced that majority owner George Gillett had defaulted on an approximately $90 million loan associated with the team. Gillett insisted that the default was technical in nature and that no payments had been missed, but published reports quoted anonymous sources familiar with the situation saying that payments had been missed dating back as far as November of 2009. "Kasey is a very talented driver and I have enjoyed watching him race,” said Richard Petty in the aftermath of the move. We all wish him nothing but the best and hope he succeeds in anything he chooses to do. Both Kahne and Gillett pledged to finish their association as strongly as possible. “I'm excited and relieved to have the decision made and announced,” said Kahne last week. “Now it's my responsibility to put all of my energy into winning races and having a successful 2010 with my current team and our sponsors." Unfortunately, succeeding as a lame-duck team – especially over a span of five months and 29 point-counting races – is much easier said than done. If things go badly for the #9 Ford in coming weeks (and the team’s last few outings give cause to believe that they might) the second-guessing and finger-pointing will almost certainly follow in short order. Perhaps more important, the loss of their marquee performer does nothing to help RPM shed the image of instability spawned by multiple mergers, realignments and management changes in recent seasons. 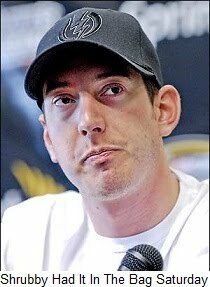 It’s remaining three drivers; AJ Allmendinger, Elliott Sadler and Paul Menard are all in the final year of their respective contracts, as well, and RPM Managing Partner Foster Gillett – son of the owner -- admitted recently that his 2011 driver lineup is, “a work in progress. We are working to have the best drivers we can. Richard (Petty) preaches to us to focus on building the best race cars we can and we'll have sponsors and drivers." Acknowledging the doubts harbored my some about the team’s ability to overcome the loss of Kahne, the younger Gillett said, "Many people were saying the same thing last year, (but) we're still here. We survived and thrived and we'll do it again. When change like this happens, it opens up opportunities for others. We are focusing on the opportunities we have more than what we lose." Gillett also said he hopes to retain Budweiser as a major sponsor after Kahne departs. “My family has a wonderful relationship with Anheuser Busch, (and) we will put out a maximum effort to keep them,” he said. “If they ask me to run through this wall, I'll do it." More power than ever is now concentrated within the walls of Hendrick Motorsports. 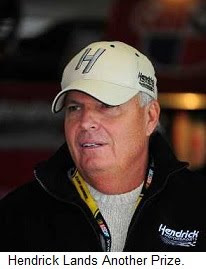 In many ways, Rick Hendrick has become the George Steinbrenner of NASCAR. He enjoys status as the ultimate “go-to destination” for NASCAR Sprint Cup Series drivers, along with the resources to hire anyone he wants and sufficient sponsorship to finance it all at an extremely high level. What’s good for Hendrick Motorsports, however, is not necessarily what’s best for NASCAR, especially in an era when many fans have already grown weary of four consecutive Jimmie Johnson championship coronations. That’s someone’s problem, but it’s not Rick Hendrick’s. His job is to win races and championships; as many as possible. He’s proven to be pretty good at it. Someone should have slapped a set of handcuffs on Ryan Newman at Phoenix International Raceway Saturday night. Instead of mugging for the cameras in Victory Lane, the Stewart Haas Racing driver should have been standing for mug shots at the local precinct house, after brazenly stealing the Subway Fresh Fit 600. With five laps to go in the race, Kyle Busch was a stone-cold lock for his first NASCAR Sprint Cup win of the season, and his first since Bristol Motor Speedway last August. He led Jimmie Johnson by two full seconds with just three laps to go, and was literally on cruise control. Over and done, money in the bank, drive safely on your way home. Then Scott Riggs blew a right-front tire and slapped the wall, bringing out the caution and setting the stage for a green-white-checkered flag finish. Solidly in the top five but no threat to win, Newman talked crewchief Tony Gibson into taking just two tires as the leaders headed for pit road, gambling that he would gain sufficient track position to make himself a contender. Busch took four tires, dropping from first to eighth for the ensuing restart. Jeff Gordon won the race off pit road with Newman second, and when the DuPont Chevrolet driver uncharacteristically spun his tires at the drop of the green, Newman was long gone, the beneficiary of the greatest act of vehicular larceny since the Brinks Job. The win could not have come at a better time for Newman or Stewart-Haas Racing. After exceeding even their own expectations a year ago by putting two cars into the Chase for the Sprint Cup, it’s been a hot-and-cold start for SHR this season. While Stewart came to Phoenix a solid eighth in points, Newman languished back in 22nd place. The #39 team needed a lift, and they got it at Phoenix, becoming the first squad in NASCAR history to win a Sprint Cup race with that particular number on the door of their race car. 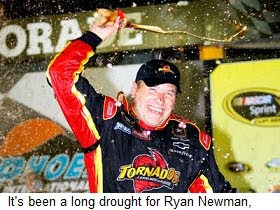 "It was tough," said Newman of a winless 2009 campaign and his 77-race absence from the winner’s circle. "I'm not going to kid you about it. Tony won (six) races. We were close, but we gave some away when we had a chance to win. Tony told me he loved me (in Victory Lane). I told him I loved him, too. This was the most emotional victory of my career because it's been so long." Saturday night’s race also provided a nice change of pace for those inhabitants of NASCAR Nation who have grown weary of the ongoing Jimmie Johnson Benefit. The four-time and defending Sprint Cup champion had a dominant car for most of the night at Phoenix, leading more than 100 laps and positioning himself solidly for the win come crunch time. But this time, he and Knaus played their cards imperfectly at the end, and were left to scramble their way to a hard-fought third place finish behind Newman and Gordon. The Lowe’s Chevrolet has now failed to visit Victory Lane in TWO CONSECUTIVE RACES as the series heads to Texas Motor Speedway, though Team 48 does lead the Sprint Cup points by 36 over Matt Kenseth’s Crown Royal Ford bunch. And finally, there was Kyle Busch, who stomped away in a huff after race. Who can blame him, really? While crewchief Dave Rogers wasn’t alone in opting for the security of new rubber all around – boy genius Chad Knaus made the same call for Johnson – Busch was literally seconds away from sweeping the Phoenix weekend. In time, he may appreciate the irony of losing Saturday’s Sprint Cup race due to a late caution flag, just 24 hours after winning the Nationwide event under almost identical circumstances. But right now, that wound’s a little too raw. "Kyle stole one last night, so now he's even," said Newman afterward. "That's racing. You never know what will happen. That's why people love this stuff. There's a lot of drama."